A new take on an old Portuguese favorite. by Art Smith with Michael Austin (Thomas Nelson, $29.99). 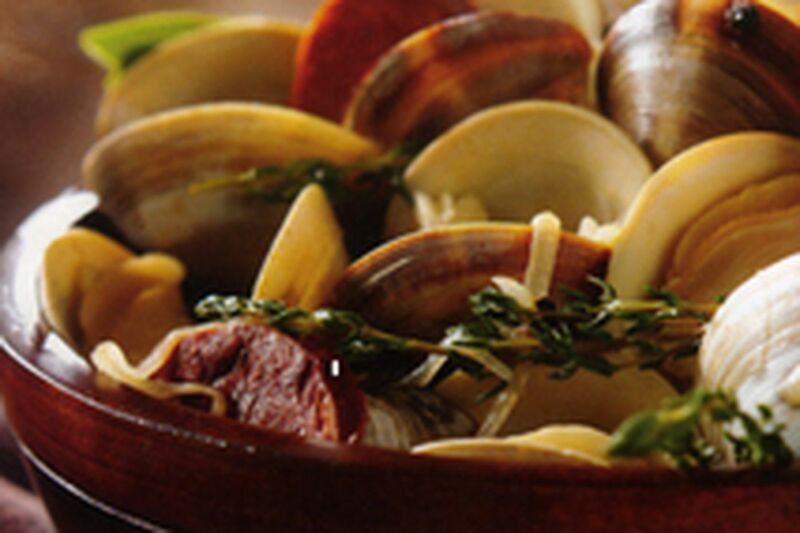 Do remember though that, unless shucked and frozen, clams are bought and cooked live. The shell should be tightly closed or shut when touched. Discard any open or broken shells. Market clams are typically cleaned and purged, but if you dig them yourself or want to ensure sand-free dining, allow time for a natural purge. Spread the clams in a roasting pan or baking dish, barely cover with cold water (ideally ocean water, but home-salted will do) and sprinkle corn meal over all. Refrigerate for at least two, up to 24, hours. 1. Heat the oil in a Dutch oven over medium heat. Saute the garlic until soft, about 2 minutes. Stir in the chile. Add the clam broth and wine. Bring to a simmer. Add the potatoes; cook until tender, about 10 minutes. 2. Add the clams; cook until the shells open, about 5 minutes. Remove from heat, add the sausage, parsley, salt and ground pepper and stir gently. 3. Ladle clam mixture into a serving bowl or individual bowls and sprinkle lemon zest over top. Garnish with parsley sprigs. Serve with good bread. Per serving: 576 calories, 39 grams protein, 39 grams carbohydrates, 6 grams sugar, 20 grams fat, 102 milligrams cholesterol, 919 milligrams sodium, 2 grams dietary fiber.